Information about the local area centred on Callac and the wee hamlet of Questellic. Questellic latitude and longitude is 48 25' 27" N, 03 25' 26" W respectively and from the air looks like this. Callac is a provincial market town in central Bretagne (Brittany), market day is Wednesday and it is best to get there early as many traders pack up and leave around noon, particularly so in the winter months. Most things are closed on Monday, Callac is not unusual in this Monday closing; a good idea for those of us who enjoy extending the weekend but something the French, at least in Callac, have been doing for years. There are a handful of small bars and cafes in Callac together with the usual small shops you may reasonably expect to find such as butcher, baker, pharmacy, newsagent etc. There are two small supermarkets, one of which is situated close to the Callac municipal gymnasium and sports field complex and the other is in the Carhaix direction; both supermarkets have fuel stations, which can be used 24/7 if you have a credit card or bank card. Callac has a railway station connecting to Guingamp and Carhaix and via these stations to the rest of France and beyond using the TGV fast transit system. The original railway was narrow gauge but this was upgraded to the national standard and is an inexpensive way to travel to the main towns close by. Callac, is Bretagne Profound in the view of many, in that, there is a very strong relationship with the native Breton tongue and customs and it is situated in the heartland of Brittany or Bretagne, with the coast about 45 minutes drive in all directions except east. The language (Breton) is similar, in many respects, to native Welsh and Irish Gaelic. The language spoken in Callac is predominately French but you can hear Breton being used, particularly at Callac market . Breton is a unique language but as previously stated has many Celtic connections, these connections are not modern; they reflect ancient ties between the Scots, the French and others. In the twelfth century, a Count of Poher had an imposing castle built at the end of the rocky outcrop overlooking the Rue de la Gare and the Rue Traversiere. The plan of this fortress forms a triangle with the "Kleuz-meur" (big ditch) at the base: one of Callac's streets is still called "Rue du Clemeur". The curtain wall was pierced to the south by two adjacent gates giving access into the square. This double gate has given its name to the "Rue des Portes" which was made later at the entrance to the feudal citadel. Within the castle, the lords and the inhabitants built a chapel, no longer visible, dedicated to Saint Catherine on what is now the Place du Centre. Little by little, the dwellings increased giving rise to the formation of a village and so Callac came into being. Callac castle was taken by the English in the fourteenth century, then besieged by Dugueselin in 1363 and demolished in 1393 on the king's orders. In 1475 the lords of Plusquellec built a new castle that was later demolished in 1552. Only the keep remained. In 1585 the Benedictines from Quimperie Abbey became the lords of Callac but they were not able to rebuild the castle. A letter from the king and an order from the court of Paris, perhaps from Richelieu, dated the 14th August 1619, ordered the demolition of the ancient twelfth century castle. It was taken apart stone by stone and these stones were used for constructing the mills of Quinquis and Kerdréquen, the church of Botmel and the tower of the vault Sainte Catherine (located on the Place de Martray). The exploitation of this strange quarry ended in about 1743-1744. Callac is the main centre of the Breton spaniel. The Breton spaniel was originally a cross between a Scottish setter and a local dog, known as the coalman. The origin of the breed is thought to have taken place circa 1800. A museum “The House of the spaniel Breton" opened its doors to the public in July 2007. Objects, drawings, paintings, photographs, videos, and original film bring to life the history of the Breton spaniel. Also, the Breton spaniel is highly sought after by sportsmen the world over. The Breton spaniel should be compact and firmly built without being heavy. The expression should be one of intelligence, strength, and vigilance. The dog should never be strongly built or cumbersome. The colour most common for Breton spaniels is white with patches of orange colour. Other allowed colours are white, black and white and liver. The coat is moderate in length, dense, flat, or undulating , with a slight change of length on the ears and the legs. Too much change is undesirable because it prevents the dog working in thick undergrowth. The Breton spaniel is obeying, intelligent and presents a strong aptitude for raising game. Typically the Breton Spaniel has a balanced and very affectionate nature, very faithful, not aggressive and would make a good pet but it’s in its element when working. This dog is sociable and usually gets on well with other animals. Sharp and sporting, it prefers the countryside to the town but can be kept as a pet in town if given plenty of regular exercise. Naous was born during 1934 in the “Loire Atlantic” region of France. 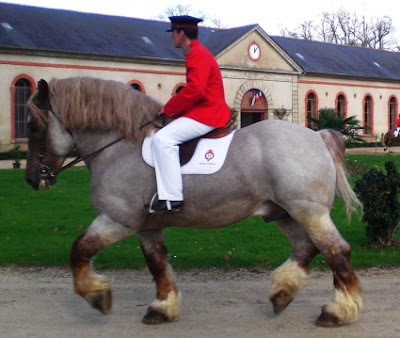 At the age of 3 Naous was bought by the Haras who sent Naous to the national Breton Horse stud farm in Lamballe Brittany. Naous commenced his stud work in 1938 at the national stud station in Callac Brittany. Naous arrived in Callac at a time when demand for animals of his type was very high; they (Breton Horses) are compact and very strong. Naous was an exceptional animal and his fame spread through Brittany and the stud station in Callac was, so to speak, put on the map by Naous. He gave 13 years loyal service before his death in 1951. The statue of Naous was moved in 2008 to a more prominent site in Callac; all due ceremony was observed. The regard with which Naous was held can be seen today in the fine statue commissioned by the Callacois (people of Callac) from Georges Lucien Guyot; the statue was erected in 1958 and stood in front of the old stable yards (above photo) until July 2008 when the statue was moved to a more prominent location in the developing town of Callac. Today, there are many festivals and show events for the Breton Horse all over the Bretagne region where competition is taken very seriously. There is an event in Callac but the event in Lamballe, at the national stud, in the month of September is the most spectacular and entertaining. People come from all over France and beyond for a full day of exhibitions and demonstrations. Europe's 3rd largest cycling event starts every year from the Place du Centre in Callac. The Pierre le Bigaut event draws up to 7000 cyclists from all over Europe and is essentially a charity event to raise money for the fight against cystic fibrosis. The event is named after a former professional cyclist who won stages in the Tour de France and is arranged in such a way to give everyone a chance to compete or have a workout on their bicycle. The Pierre le Bigaut event is run over a few distances from 25k to 160k and the winner is research into cystic fibrosis. The event was started by Daniel Bercot in memory of his son who succumbed to the disease in 2000 and in the past 3 years has contributed more than 500000 euros to research. The whole town of Callac is taken over by the event and all the local people (the Callacois) join together to decorate the town and arrange catering and amenities for the event. The evening in Callac, after the event has ended, is a great social affair celebrated with a fete de crepe in the local gymnasium which, in turn, has been transformed into an enormous dining room with crepe stations along the entire length of the building. Freshly made crepes and cider are the order of the day and a great time is generally had by all.